We all want to feel good in our own skin. And so we shoot for that magical number on the scale. But what exactly does the number mean? Is some chart’s ideal body weight really your ideal body weight? Here are a few facts about body weight you just may find surprising. 1. The scale doesn’t tell the full story. 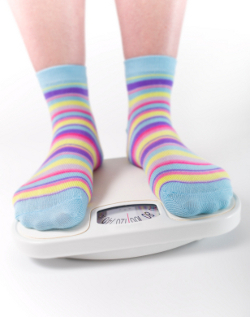 When you step onto the scale, chances are you have a number in mind you’re hoping to hit. But so many factors—including healthy ones—can affect your weight at any given moment. Are you well-hydrated? When did you eat last? Have you pooped? Yes, I said poop! Waste sitting in your gut weighs something! Heavy, dense bones and strong muscles are good things. They also weigh more. 2. Body Mass Index (BMI) can be about as useful as scale weight. Okay, so BMI does take into account your height. This is why it became the preferred choice of doctors over just weight. Reread fact number one above for a review of why this is not a good method to determine your ideal body weight (even if it is “doctor-approved”). You can carry very dense muscles and bones on your body and be told you’re overweight—or even obese—according to the chart. Or you can be in the middle of an unhealthy, anorexic spell and have a doctor tell you how awesome that is (yes, it really happened). You don’t, after all, see too many Americans fall at the low end of their BMI range. Medical professionals are becoming enlightened, though. They’re even writing into their professional journals about how BMI just doesn’t cut it anymore. 3. You can be “skinny fat”. When you lose weight you lose more than just fat. You lose muscle. This is especially true for fast weight loss. This is also why it’s important to strength train so you maintain muscle mass. More muscle mass helps to maintain a slightly higher metabolism, not to mention a more shapely body. But just because you’re at a desirable number on the scale, doesn’t mean your body fat percentage is healthy. If you’ve lost a lot of muscle mass in your weight loss quest, you will have a higher percentage of body fat. You look thin, but ultimately, you’re not. You’re also not as healthy as you could be. Muscle rocks! And it will probably make you weigh more than if you had less of it. Have your body fat percentage measured to determine if you’re “skinny fat”. 4. You can be at an ideal weight, but still carry too much fat around your middle. Just because the scale says you’re healthy, doesn’t mean the measuring tape will. Belly fat comes with a higher risk of disease, including heart disease, diabetes, and even some forms of cancer. Take a tape measure and measure around your waist at about the same level as your navel. A high-risk waist circumference for men is over 40 inches (102 cm), for women 35 inches (88 cm). See: Is Your Belly Fat Killing You? 5. You’re more than a number. We tend to get all wrapped up in that number on the scale. Then we equate it with our self-worth. When the number hits where we want it, we’re “good”. If it doesn’t, well, why bother. Here begins the cycle of beating ourselves up and throwing in the towel. I mean really. If you can’t even get to a certain weight, you must be a horrible person. See how silly this sounds? Not only does the scale not tell you the whole story about your body, it really tells very little, if anything, about who you are as a person. It can’t measure happiness. It can’t tell how giving you are. It can’t rate your personality. It can’t tell you that you’re a good parent, partner, or friend. It simply spits out a number of what your overall momentary weight is. Your own personal ideal body weight is what feels good to you. Your best weight is where you feel your best. Stop allowing some number to undermine your self-worth! Ideal Body Weight Chart – Should You Use One? Carrie Myers has a BS in exercise physiology and health education. Through her company, CarrieMichele Fitness, writing, and speaking, she has encouraged thousands of women to embark on a non-dieting, holistic lifestyle approach to weight loss.